AVALON — For the last 38 years, the annual Avalon Harbor Underwater Cleanup has attracted scuba divers for the honorable cause of ridding Avalon’s harbor of trash and waste. This cleanup has grown to be one of the most highly anticipated events for ocean patrons and divers alike, now attracting more than 500 volunteers. 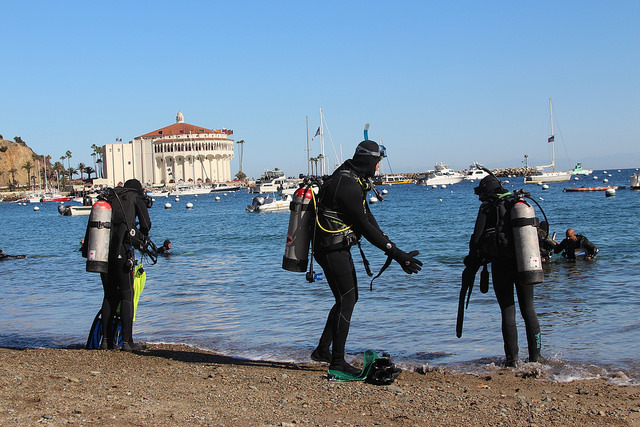 Catalina Conservation Divers and USC Catalina Hyperbaric Chamber invite divers to participate in this year’s event taking place on Saturday, February 23. According to USC Dornsife’s official website, last year’s event saw 498 participants gather 2,320 pounds of trash. There are several diving locations for the cleanup event including Casino Landing, Step Beach and Green Pier. Diving orientation begins on the day of the event at 9 a.m. and divers will enter the water at 9:30 a.m. Following the cleanup, raffle prizes will be announced at the award ceremony from 1 p.m. until 3 p.m. at the Wrigley Stage. Though early registration has passed, divers can register for $55 per person between now and Feb. 14. Registration leading up to the event and on the day will be $65 per person. At check-in divers must bring the Safe Diving Practices Form and Informed Consent and Waiver of Release Form, found on the website, in order to participate. Non-divers can participate for $30 per person. Check-in for the event begins at 7 a.m.
All proceeds of the event benefit USC’s Catalina Hyperbalic Chamber and Wrigley Institute Scientific Diving Program. Information about sponsorships, prize donations and volunteering is also available on USC Dornsife’s website. For those who are artistically gifted, there is a call for 2019 t-shirt design contest, the official t-shirt of the event; the deadline is Jan. 31. Registration can be completed online at dornsife.usc.edu/Wrigley/wies-ccd-cleanup. Organizers request dive teams send a request to be added to the drop list prior to registration by emailing chvostal@usc.edu. For inquiries about the event, call USC Hyperbalic Chamber at 310-510-4020 or email wies-ccd@usc.edu.